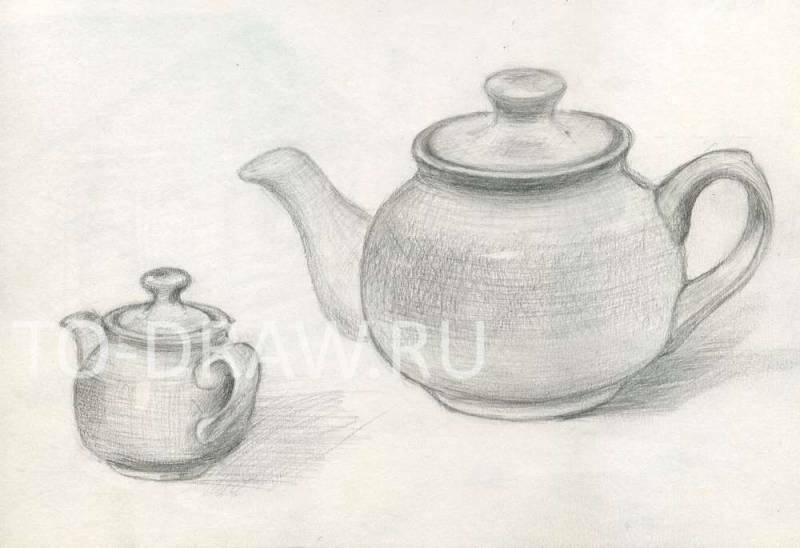 Drawing - a teapot. Outline of household items. The picture of the teapot. Train to portray the same subject from different angles, rotate to different sides and convey the exact shape of the parts. Find a good angle. This figure shows the teapot. In one case we see the nose quite a bit, in the other - and the spout and handle are completely visible. You can find many other interesting angles varying complexity. On one sheet you can make a few sketches of one subject and then compare them, analyze how accurately captured the shape and volume. Multiple sketches allow us to accurately study the subject, to "understand" it, and this "understanding" inevitably leads to improving the quality of your drawings and drawing speed. In the same way you can draw a group of objects by placing them on the table, but changing its position. Therefore you will see each time a new perspective. But about this we will speak later.